Many thanks to everyone who braved the rain and came to our traditional 'end of season' event. 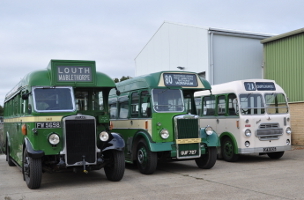 Many of the Museum's cars and buses took to the road along with a variety of guest buses and coaches, and were kept busy operating our park and ride service and regular services to Lincoln city centre and to Doddington Hall and the Natural World Centre, Whisby, as well as local tours. Many more visiting classic cars and buses were on display for the day. 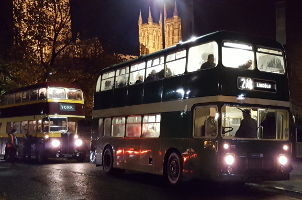 Three of the Museum's car fleet in action. 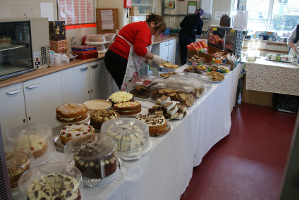 Setting up - all of these cakes (and more) were eaten by the end of the day! Lincolnshire Road Car Leyland TS7, Southdown Leyland PS1, Lincolnshire Road Car Bristol SC between journeys. A list of the cars and buses that were on the road can be seen here. Many thanks to all our visitors and volunteers, especially the owners of vehicles that were displayed or run on the day. Our thanks also to Tesco, Wragby Road Lincoln and Lincoln Business Improvement Group for allowing us to display vehicles in prime locations before the event to promote our open day. Our thanks also to our neighbours on and around Whisby Road, Siemens at Teal Park and Lindum on Station Road for their help and support on the day! Report and pictures from past open days - Easter 2016 - November 2015 - Easter 2015 - November 2014 - Easter 2014 - and some videos of past events on YouTube can be seen here.